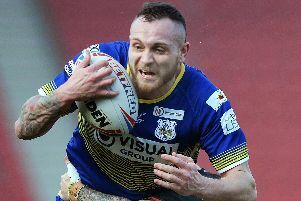 Table-topping Doncaster RLFC might have got the result they wanted in Sunday’s League One win at Newcastle but not the performance, according to assistant coach Pete Green. “We’ll certainly need to play better against a strong York City Knights side in Friday’s home game,” said Green, reflecting on the 22-20 result. “We made things very tough for ourselves against a side who will prove hard to beat at home this season and made far too many handling mistakes – especially in the first half. “They had several players back who missed the Challenge Cup game against us the previous week and they looked a good side. “They got off their line really well and both controlled the ruck and the ball better than we did in the first half. “They had far more possession and territory and put us under all sorts of pressure at times and they will have been disappointed to go in behind at half time. “The massive plus for us was the way we defended. The way we scrambled and the commitment was absolutely brilliant and that is what kept us in it really. “We said at half time that if we got a fair share of the ball in the second half that we’d cause them trouble as we had done on the rare occasions we got into a good position in the first half. “But for the first 20 minutes or so it was mainly one-out football and the halves got little chance to shine because we were that tired from all the defending we’d been doing. “Fortunately we had a good spell for seven or eight minutes when full-back Hakim Miloudi came into the game more and he helped make a try and scored one himself and that won us the game. n Every child who attends Friday’s game against York City Knights will receive a free Easter egg.